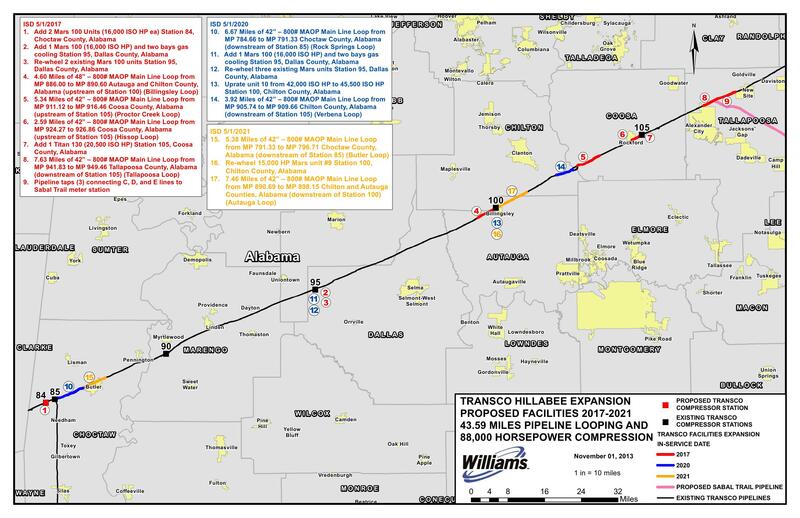 The third link: Sabal Trail plans to get its gas from Williams Transco’s Hillabee Expansion Project in Alabama, FERC Docket #PF14-6. Here’s an excerpt from the Cover letter, Request for Pre-Filing Review, 4 November 2013. Transcontinental Gas Pipe Line Company, LLC (“Transco”) respectfully requests that the Federal Energy Regulatory Commission (“Commission”) Staff initiate a pre-filing review of Transco’s proposed Hillabee Expansion Project (sometimes referred to herein as the “Project”). The Project is an expansion of Transco’s existing natural gas transmission system in Alabama that will enable Transco to provide an approximate 1,131,730 dekatherms per day (“dt/day”) of incremental transportation capacity to be constructed in three phases. The capacity created by the Project will be leased to Sabal Trail Transmission, LLC (“Sabal Trail”). The initial phase of the Hillabee Expansion Project is targeted to be placed in service May 1, 2017. 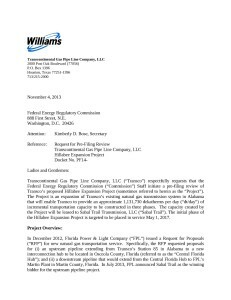 In December 2012, Florida Power & Light Company (“FPL”) issued a Request for Proposals (“RFP”) for new natural gas transportation service. Specifically, the RFP requested proposals for (i) an upstream pipeline extending from Transco’s Station 85 in Alabama to a new interconnection hub to be located in Osceola County, Florida (referred to as the “Central Florida Hub”); and (ii) a downstream pipeline that would extend from the Central Florida Hub to FPL’s Martin Plant in Martin County, Florida. In July 2013, FPL announced Sabal Trail as the winning bidder for the upstream pipeline project. 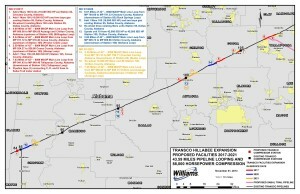 The Sabal Trail Project will provide 1,100,000 dt/d of firm transportation through (1) the capacity leased under Transco’s Hillabee Expansion Project from Transco’s existing Compressor Station 85 in Choctaw County, Alabama to a location near Alexander City, Tallapoosa County, Alabama; and (2) the construction of 460 miles of greenfield mainline facilities from the interconnection with Transco near Alexander City, Alabama to the Central Florida Hub.1 At the Central Florida Hub, Sabal Trail will connect with the downstream pipeline to be constructed by Florida Southeast Connection, LLC (“FSC”).2 The initial phase of each project has a target inservice date of May 1, 2017. 1 The Sabal Trail project is currently undergoing pre-filing review in Docket No. PF14-1. 2 The FSC project is currently undergoing pre-filing review in Docket No. PF14-2. 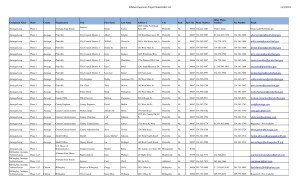 Here is the rest of the letter and all the attachments, including lists of governmental permitting agencies and of non-governmental contacts.